Text of FDR’s closing statements from this address appear below. 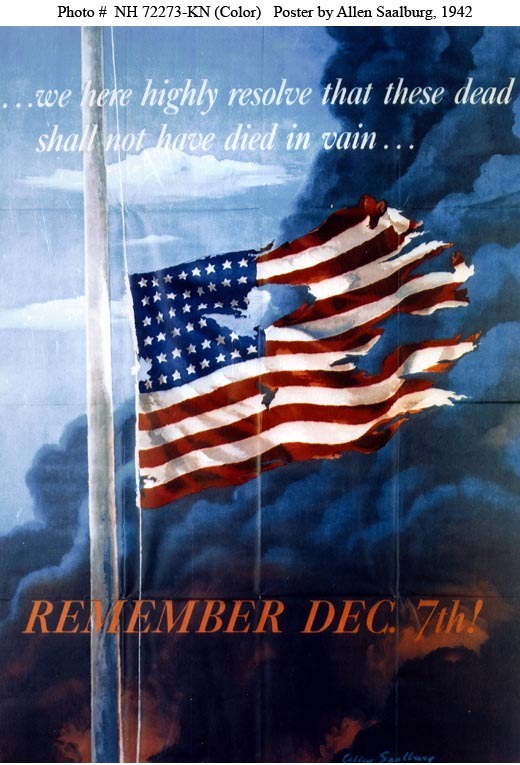 In the aftermath of the sneak attack on December 7, President Franklin D. Roosevelt in his radio address to the nation, reported 2086 United States Navy and Marine Officers and Men were killed and 749 wounded, and 194 Army Officers and Men killed and 360 wounded, at Pearl Harbor when the Japanese Navy attacked without warning – without a state of war existing between our nations – on December 7, 1941. Following are a few photos and details on some of the ships that suffered major damage, and in the case of USS Arizona, the greatest loss of life. Foreground, left to right: USS Nevada, USS Arizona with USS Vestal outboard, USS Tennessee with USS West Virginia outboard, USS Maryland with USS Oklahoma outboard, USS Neosho and USS California. USS Arizona Memorial, built over the sunken hull of the battleship that remains the tomb of many of the 1177 members of her crew who died that day. Those who survived have the right to choose interment inside the ship; rejoining their shipmates at the end of their lives. The USSARIZONA.ORG website is an excellent site for information on the Arizona and her crew. USS West Virginia took two bombs and two torpedos, and was sunk, but returned to service in July, 1944. Although USS Shaw took three bombs, she returned to service in June, 1942.
over Hickam Field in the aftermath!!! at Pearl Harbor, Territory of Hawaii, December 7, 1941. I don’t know the history of this monument, nor who took the photo. Source not known. I received it in an Email message. “…No matter how long it may take us to overcome this premeditated invasion, the American people in their righteous might will win through to absolute victory. I believe that I interpret the will of the Congress and of the people when I assert that we will not only defend ourselves to the uttermost, but will make it very certain that this form of treachery shall never again endanger us. Hostilities exist. There is no blinking at the fact that our people, our territory, and our interests are in grave danger. With confidence in our armed forces, with the unbounding determination of our people, we will gain the inevitable triumph — so help us God. This entry was posted in Foreign Invasion, In Memoriam, Memorable Days, One Nation Under God and tagged 1941, a date which will live in infamy, Admiral Isoroku Yamamoto, American Flag still flies over Hickam Field, Battleship Row, December 7, December 8 1941, Franklin Roosevelt, God Bless America, I fear all we have done is to awaken a sleeping giant, Isaiah 6 8, Itasca, Japanese Attack Pearl Harbor, Our Nation under God, Pearl Harbor Address to the Nation, Remember Dec 7th, SEND ME, United We Stand, USS Arizona, USS Arizona Memorial, USS California, USS Maryland, USS Neosho, USS Nevada, USS Oklahoma, USS Shaw, USS Tennessee, USS Utah, USS Vestal, USS West Virginia, WHO WILL GO SEND ME, William Brooks Courtney Jr on December 7, 2013 by Itasca Small.